Don’t trust the weatherman? Who would? He says it’ll be a fine, sunny day…and it rains. Or he tells you it’ll be showery, so you stay inside...and miss a perfectly good day outside! With Barigo’s collection of stylish barometers, thermometers, weather stations and more, you can be the weatherman! You’ll always know what the weather’s going to do…and if you’re ever wrong, you’ll only have yourself to blame. Barigo is the name weather-watchers everywhere love! 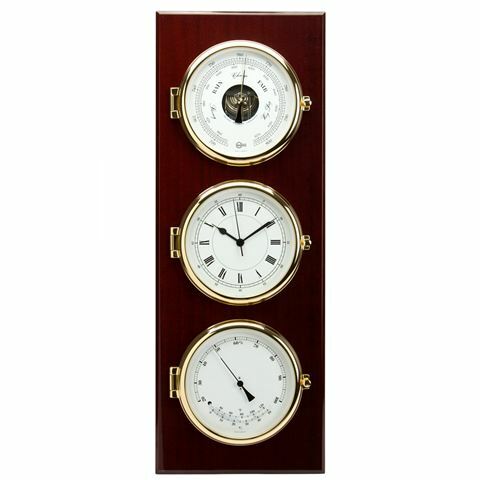 Each of these astounding, hand-crafted pieces will look great in your home, and provide you with an accurate instrument with which to observe the weather. It makes a fantastic gift for any amateur meteorologist! Good things come in threes. The Barigo Walnut Weather Station has three dials to observe – at the top is a barometer, in the middle is a clock, and the dial underneath acts as a thermometer and hygrometer. This elegant, wall-mountable unit is everything you need to take over from the weatherman! Wooden backing made from dark, polished walnut wood. Includes instructions to help you get the most out of your Weather Station. Clock is German-made, with quartz movement. It requires one AA battery, not included. Able to be easily mounted on a wall in your house. Should be mounted inside, in a shady position. Dimensions: 61 x 22 x 5cm.